The Scooter Arm Tote products are designed to keep personal belongings within reach. Features include full-length zipper with easy-pull zipper cord. Totes attach quickly and easily to the arm of scooter using nylon strap with adjustable attachment. They can be attached facing the rider or away. Made of durable nylon fabric - black in color. Attaches to any Scooter/Wheelchair armrest or simply the side of your wheelchair. Warning: To help prevent theft, when riding in public areas it is recommended any tote bag be mounted in such a way as to not leave valuables exposed to passers-by. Convenient. Stays in Place. Easy to Use. Comfortable. Can Withstand Use. Daily Use. Short Trips. Long Trips. Travel. Home. 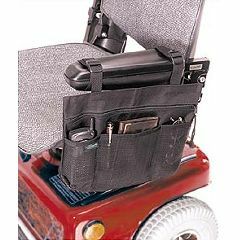 My husband uses the bag on the arm of his power chair. He uses it every day. It helps him kept his wallet and things he needs close so he can have them when he needs them. Finally a side tote that truly works! Elderly. wheelchair user & MS pt. .
Can Withstand Use. Stays in Place. Easy to Use. Zipper easy to use with one hand. Stays in Place. Easy to Use. After buying other arm totes, this model's best. The works easily, the strap buckels don't wind up on top of arm, it hangs well as to allow passage through tight doorways. I got the small, and then the large for the other arm. I reccomend the large to start. Other totes with flap openings won't hang tight, and the velcroe almost impossable with one hand. CAN THIS HOLD A METAL BEVERAGE CUP, W/ LID & HANDLE THAT IS ABOUT 7" TALL 3' DIAMETER??? This bag was a waste of my money. It didn't hold much at all, needed a bigger bag. I would like to return it and get my money refunded. No. This is a small, thin, flimsy, cheap item. Pockets will hold only items the size of pencils or pens, or possibly a pad of paper. We could never figure out how to attach it. Buckles made no sense and failed. We donated it to Good Will. Yes, the large bag can hold your cup. If it doesn't fit in a front pocket, unzip the big pocket 3 inches and put it in there. I really like mine. It holds quite a bit.